Feadship has successfully completed the final handover of the 57-metre Halo to a delighted owner. This pure custom motoryacht is now speeding away from the cool late-autumn weather in the Netherlands and heading across the Atlantic where the owner will enjoy a maiden cruise in much warmer climes. Halo was outfitted in a record time of just 33 months. The radical exterior styling by Eidsgaard Design was created in close cooperation with the owner. Dark window bands in a warm grey Awlgrip Mocca unite the side deck windows. With a cruising speed of 16 knots and a range of 5000 nautical miles, Halo has been specifically designed for world cruising. The sun deck is exceptionally large for a 57-metre yacht. The dark grey coloured custom Jacuzzi stands out visually, and can be easily covered by an innovative carbon fibre sun awning built into the canopy that slides out electrically. Further forward, Halo has an enclosed mooring deck, with hatches that open on both sides, and a helicopter platform. Aft are two large garages either side of the centreline beach club for Halo’s two custom eight-metre tenders. The tenders are launched by an innovative system of overhead beam cranes and the door of this area slides up and under the sun pad on the main deck above to open to the water. 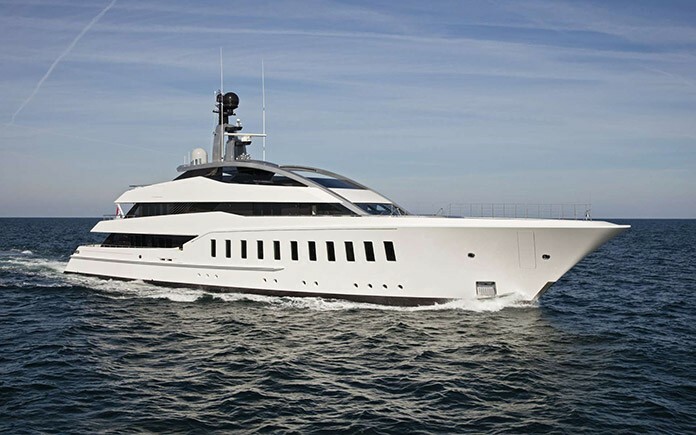 Halo was officially launched in her owner’s presence at the Feadship Kaag yard, exactly on schedule in mid-August. 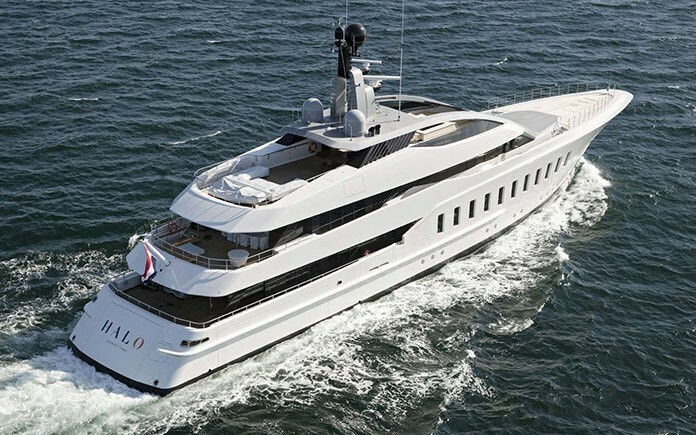 This followed a record-breaking outfitting time of just 33 months, which would have stretched the organisational capacity of any yard other than Feadship. Ultimately, Feadship’s engineers and craftsmen proved the yard’s unrivalled capacity to smoothly meet an exacting brief on time. Over the past two months, Halo has been going through the unprecedented sea trial regime to which every Feadship is subjected prior to final delivery. Having easily coped with everything the North Sea could throw at her, this latest member of the Feadship fleet has now embarked on an exciting cruise and itinerary. The owner, who is very pleased with the outcome, is looking forward to enjoying bespoke features such as the fully integrated Apple TV platform, which perfectly mirrors that found in the owner’s house. 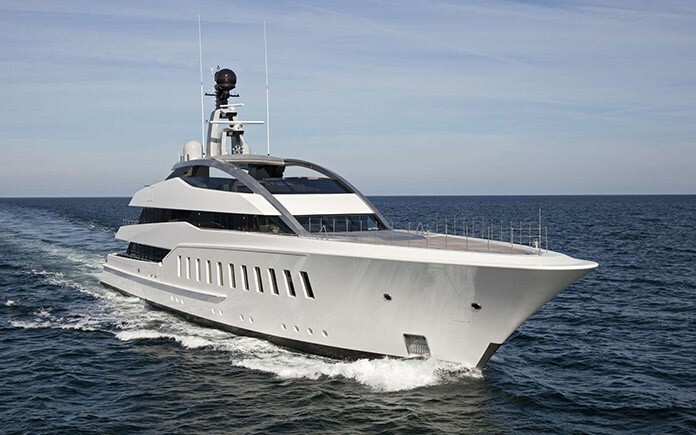 Other highlights include a sun deck of unprecedented size for a 57-metre motoryacht, with an innovative carbon fibre sun awning built into the canopy, which is electrically extended and retracted. 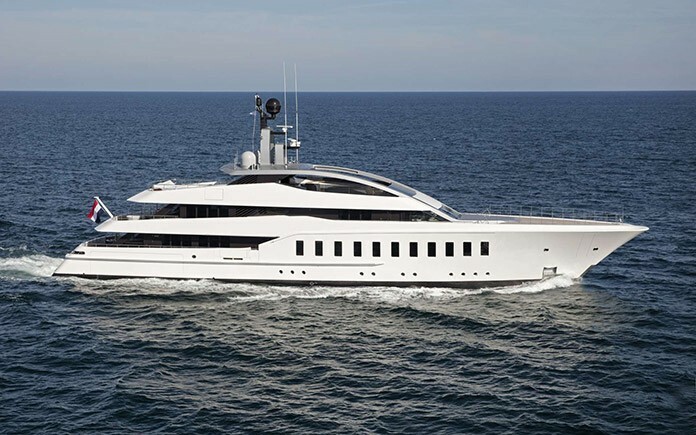 Since the launch of Halo, her radical exterior styling – created by Eidsgaard Design in close cooperation with the owner – has received a great deal of praise from the media and Feadship fans alike. All are impressed by the huge silver metallic arches that run from the bridge coaming and up and aft over the sun deck. The first-time deployment of a warm grey Awlgrip Mocca livery on parts of the exterior has also been a source of considerable interest. With a cruising speed of 16 knots and a range of 5000 nautical miles, Halo has been specifically designed for world cruising. Her journey – and that of her owner – can now begin in earnest.